12-4-01 This will be the last Newsletter for a while. The racing season is over and not much will be happening for a while. I'll keep you posted when major events occur (like the paint job). In the mean time here are the dates of next years racing events. 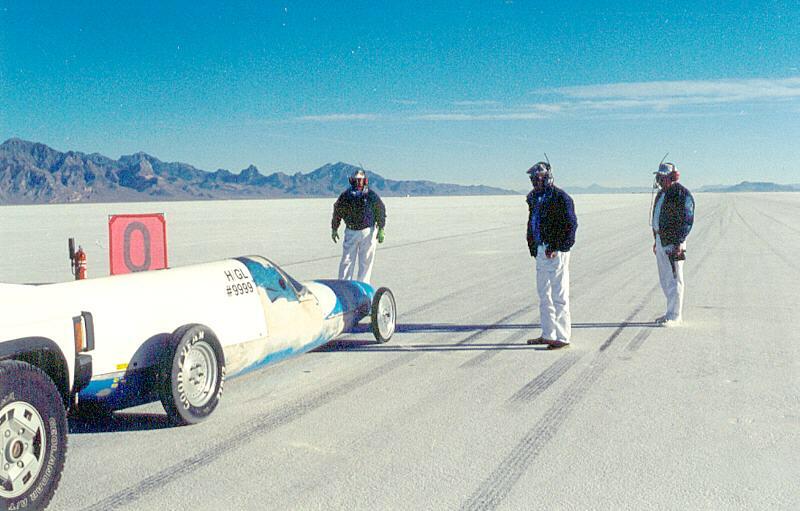 Additionally, Mark wrote a short essay trying to capture the flavor of racing at Bonneville, please enjoy. by Mark Vigeant It's really bright from all the white salt. It's kinda cool out, so you don't mind putting on the fire suit. As you've done so many times before, step into the car, slide down and wiggle into position - its a tight fit. The safety harness gets tightened, check to be sure you can touch all the controls and pedals. You close your eyes and take a few calming breaths.... All right, it's time to fire it up. Start doing the check list....Main power on, Ignition on, START..... It roars to life. With the helmet on you can hear everything; timing chain, pistons going up and down, strapped tightly in to the car, you can FEEL how its running,... Final safety check from the starter... he gives a tug on the harnesses, checks the helmet, gives you the thumbs up. Your crew steps back in...computer on... recording... the canopy comes down and latches with a very solid sound. You get a sense of isolation; it's only you, your machine, and so many miles of open track, that the finish line lies over the horizon. The butterflies are all gone... Put it into first, the car lurches. The push truck bumps you then starts you up to speed, let the clutch out. The RPMs come up, give it more throttle, it goes from 6000 rpm to 10,000 so quick if you blinked you missed it. You flick the air shifter switch, 2nd gear, 3rd gear, thing are happen pretty fast. Mile one. 4th gear, 5th gear, 6th gear. Mile two. The work is mostly done now, just drive. Mile three: 8500 rpm. Mile four: 9300 rpm, The miles are going by in less than 20 seconds. The car starts to drift a little. Coming up on the mile five marker, the finish line, 9500 rpm, start thinking about the shut down. Through the mile five marker: Clutch, Ignition switch... nothing but wind... 'Chute out, let it coast... Mile six... start to turn off but the turn out is a little sharp, you're out it the "crunchies" that part of the salt that has not been graded. Keep turning left, it's so rough out here your vision is blurred. You come to a stop... Utter silence. The world seems frozen in time, nothing is moving. Now the only sounds; breathing and a slight rustle, fumbling for the belt release. "Pop" the canopy. Ed and Cris drive up to be sure everything is okay. You pull off the gloves and helmet with that silly grin on that can only say... "WHAT'A RIDE..."